I actually stumbled onto one of OC's most notable new sushi openings almost by accident. What happened was that I was looking for a good sushi spot in the Fullerton area (spoiler: there's not much), and found this place called Kaori. 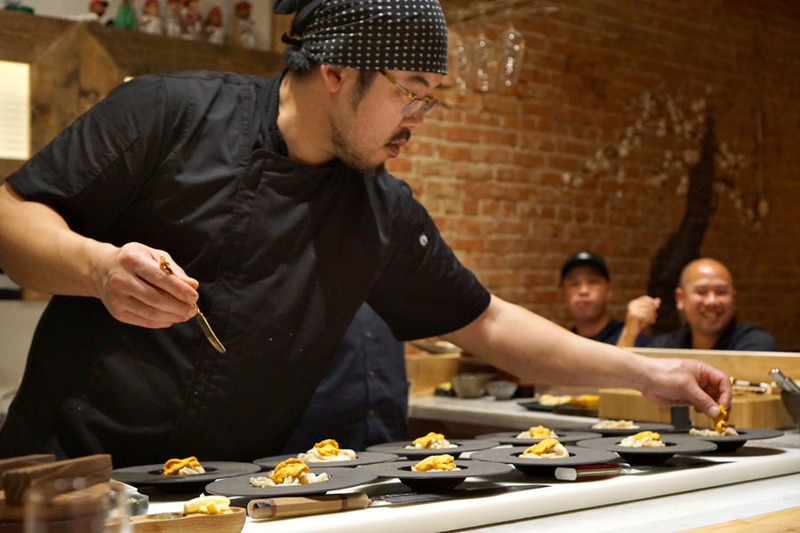 Upon delving further into Kaori, I soon discovered that its Chef/Owner Gino Choi had left and opened a much more intimate omakase-focused spot at the end of December. After being intrigued by what little information I could find about OmG, I decided to go ahead and make a reservation. 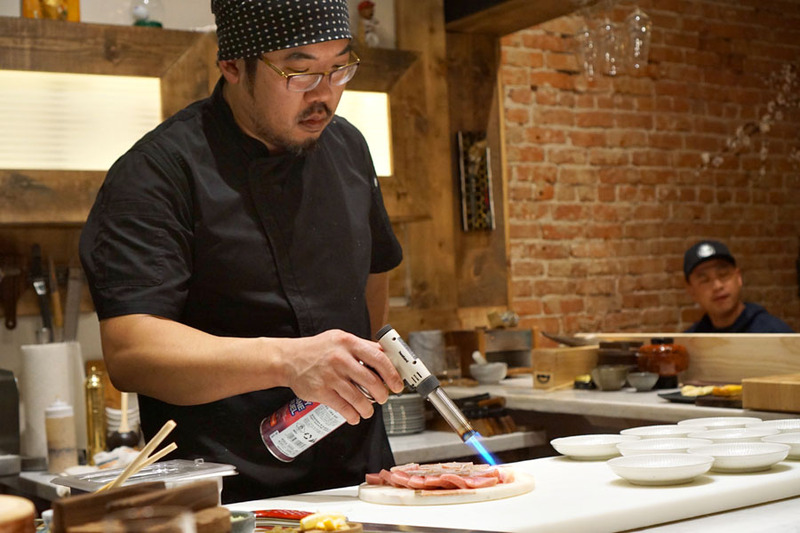 About the Chef: Choi Jin-ho was born in Seoul and spent the bulk of his childhood there. He didn't get along with his father, a strongheaded former pro rugby player who operated an Argentinean chicken restaurant (dad used to live in Argentina). His grandfather, meanwhile, was raised in Japan, and took his grandson to live in Tokyo on-and-off, months at a time. He began cooking when he was seven, learning from his great-grandmother, though curiously enough, he never really liked Korean food growing up. Choi's first professional kitchen gig came at age 13, when he started working part-time at an Italian restaurant in Seoul. He continued cooking during his teenage years in order to make money, and also started getting attracted to the art of sushi during this period. He graduated high school in 1998, and later went to college for music, guitar specifically. In addition to cooking, he also worked as a motorcycle mechanic in college. Choi moved to the US permanently in 2002, at the age of 22, and settled in California (fittingly, since he enjoys surfing). His first job was at a place called Onoya(sp?) in Huntington Beach, but he soon quit when it turned into an all-you-can-eat joint. 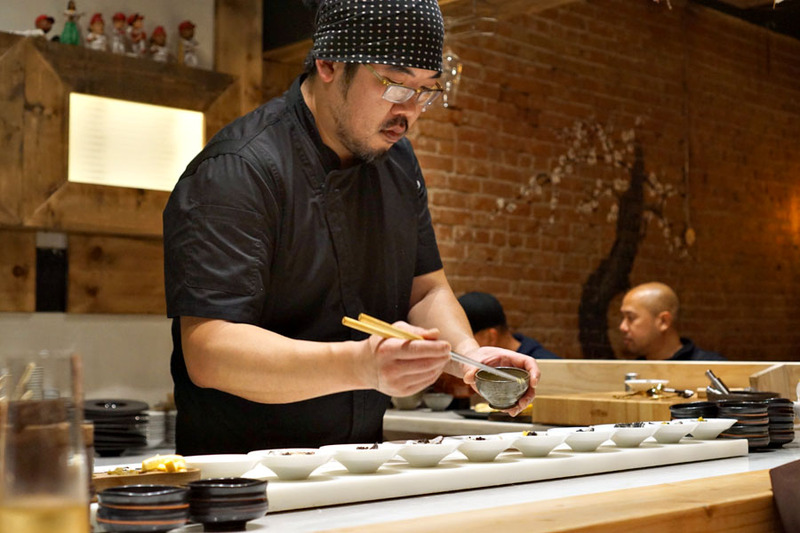 He then found a mentor in Hideaki Kikuchi, of the late Kikusui Hillside Village in Torrance, and honed his traditional sushi skills under him. In 2003, Choi opened his first restaurant in Tustin, which he had for about four years. This was followed by the debut of the aforementioned Kaori in Fullerton in mid-2007. The original restaurant was located at 500 N Harbor, but later moved to a new site a short distance away in 2011. The Chef ended up selling his stake in the business in the middle of last year to focus his energies on OmG. OmG occupies a space just a couple doors down from Ross Pangilinan's Mix Mix. It used to be home to the likes of Gu Ramen, Paninoteca Maggio, Yoky's Pollo a la Brasa, and Rostizeria La Gloria, and now sports a decor that blends traditional Japanese sushi bar aesthetics with some more eclectic, whimsical touches. Above is the view from one end of the 10-seater bar. 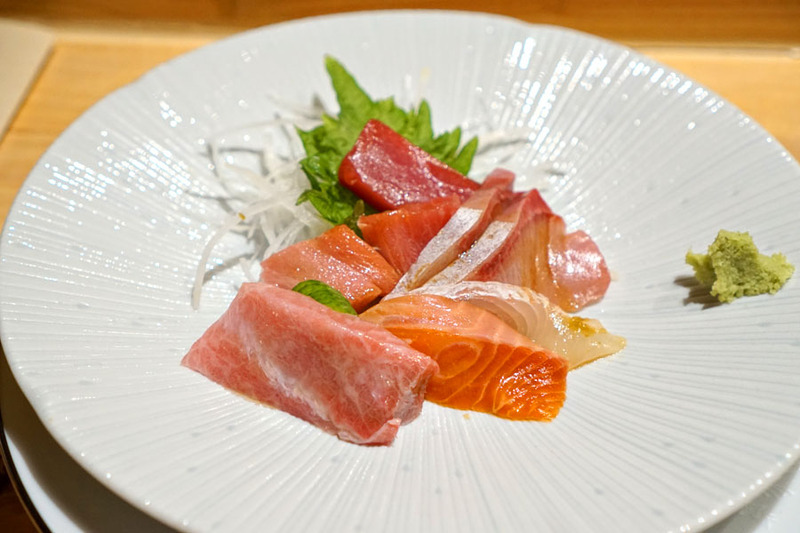 There's only one menu option at OmG: a 20-ish course omakase priced at a reasonable $105 a head that comprises a few sakizuke starters followed by sashimi and a parade of nigiri. 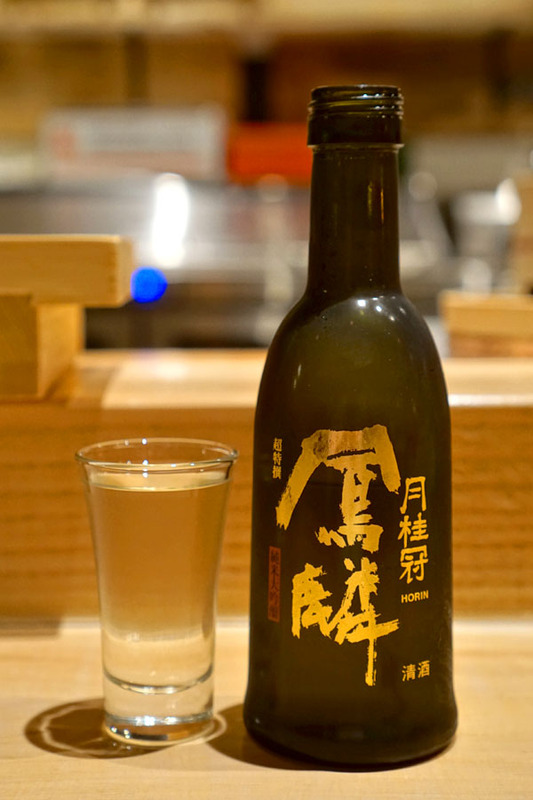 In terms of beverages, you get a small selection of sakes and beers, as well as a couple wines. Corkage is $30 a pop, with apparently no limit as to number of bottles. Click for larger versions. 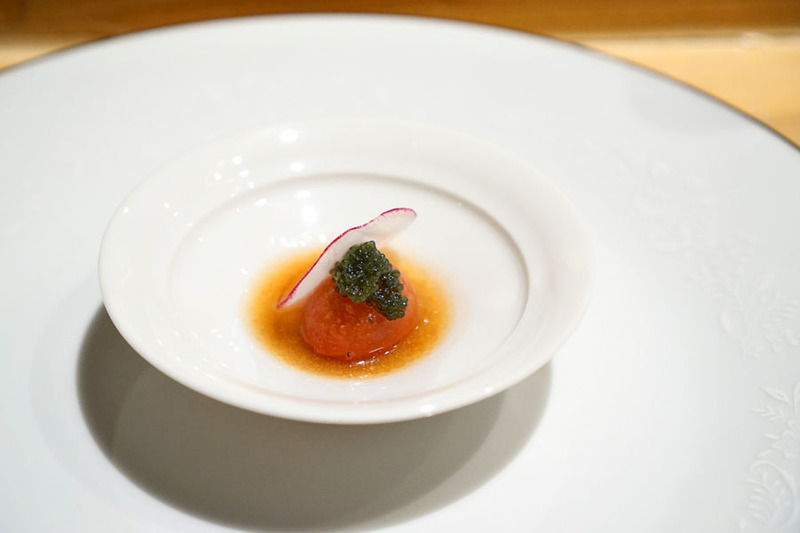 In our first bite, the sweet-tartness of tomato was joined by the oceany sea grapes and a zingy sauce that featured what I believe was nashi pear and ground sesame. 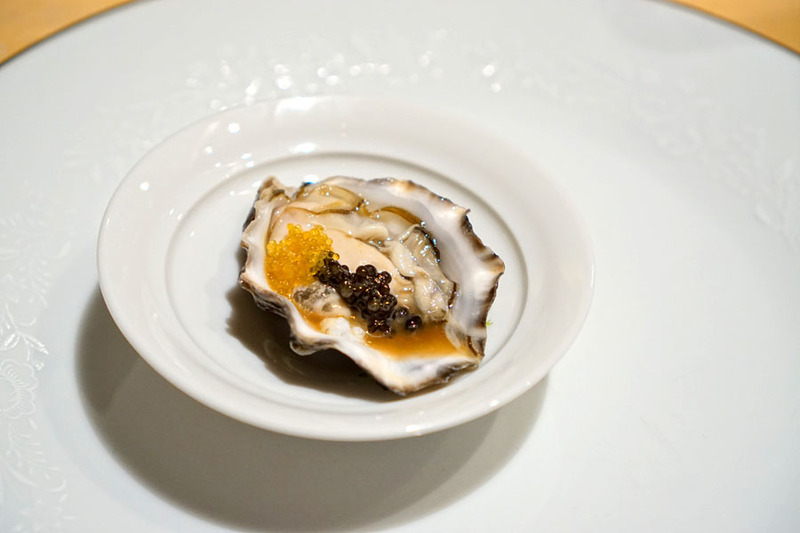 A creamy Kusshi oyster had its brine augmented by Siberian caviar while the yuzu tobiko offered up a citrusy contrast. I also appreciated the sort of "crunchy" texture imparted by the flying fish roe. 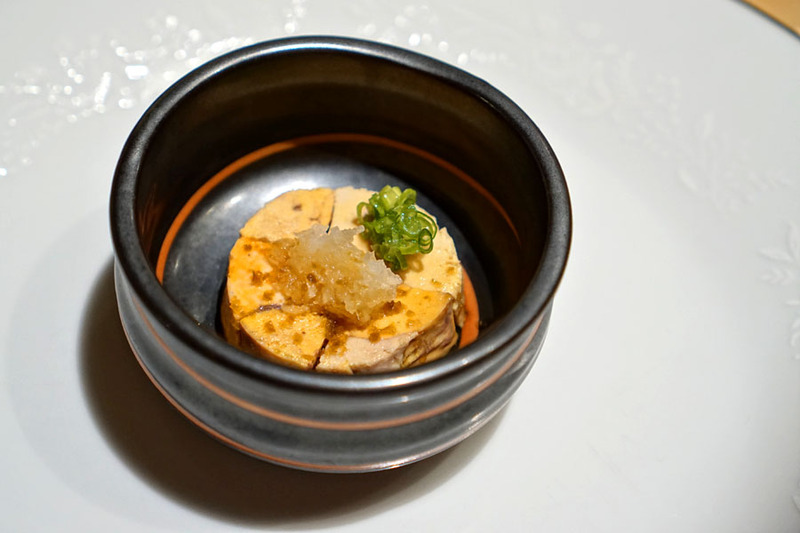 Monkfish liver showed off a delicate, almost chicken-like savoriness to it that worked beautifully with the prickly heat of the paired jalapeño ponzu. Spanish tuna arrived lightly seared, making for an unabashedly fatty, oily, smoky bite that was smartly offset by the sweet-n-tangy nature of the shishito sumiso sauce. I got a nice herby counterpoint from the microgreens, too. 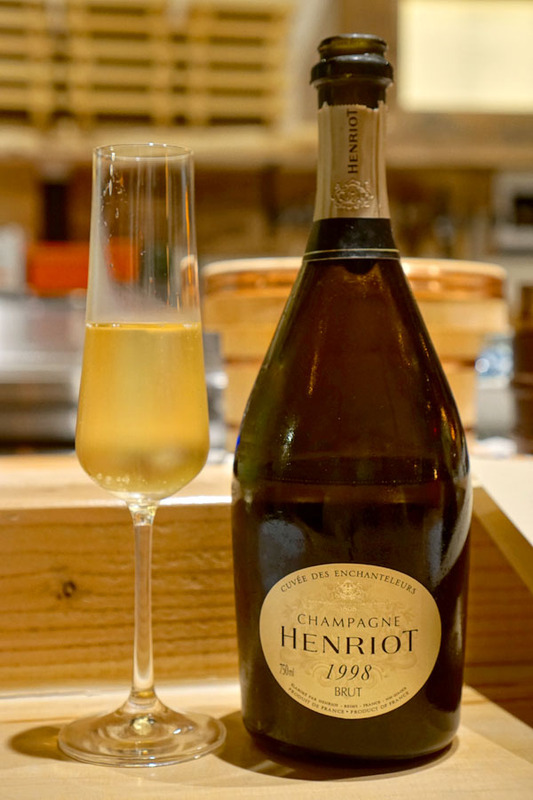 To drink, we began with a bottle of the 1998 Henriot Champagne Cuvée des Enchanteleurs Brut. This was a mature sparkler, one giving aromas of mushroom-y funk, toast, oxidation, caramel, and light pome fruit. On the palate, I got more oxidative notes and more breadiness, alongside an earthy, barnyard-y character, all while the finish showed off lively citric qualities. The chawanmushi seemed appropriate for the chilly weather we were having. 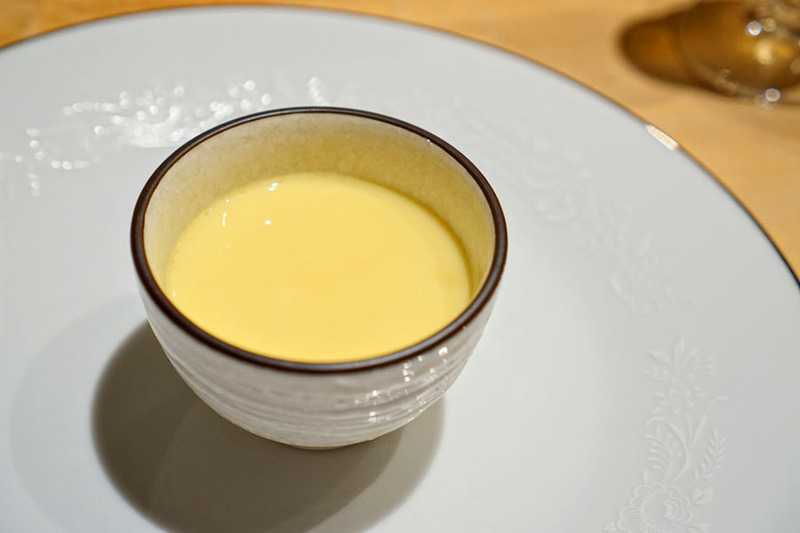 It was a cozy, umami-laden egg custard, one containing briny bits of shrimp and crisp shards of bamboo. 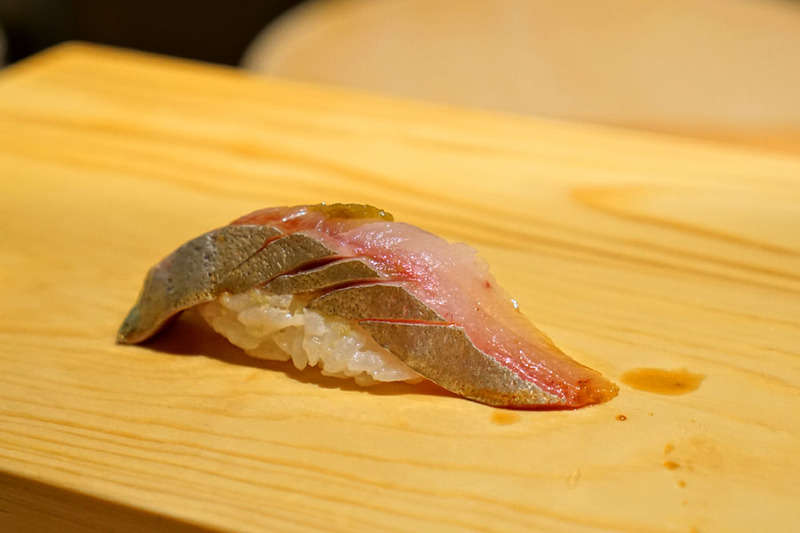 Akami - A soft, mild presentation of bluefin, with a slight bitterness. 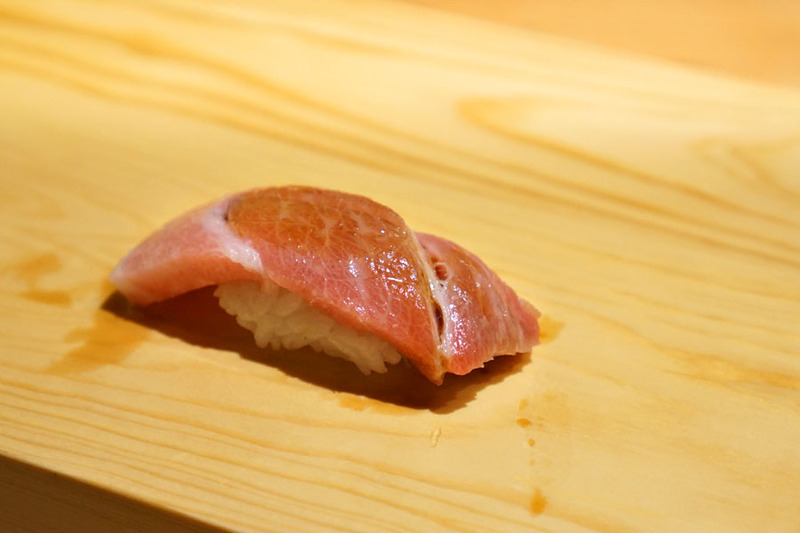 Chutoro - A definite step up in terms of fattiness and sweetness. Otoro - Super savory and luscious, this one had a trace of sesame oil I believe, which actually worked as an effective foil to the fish. 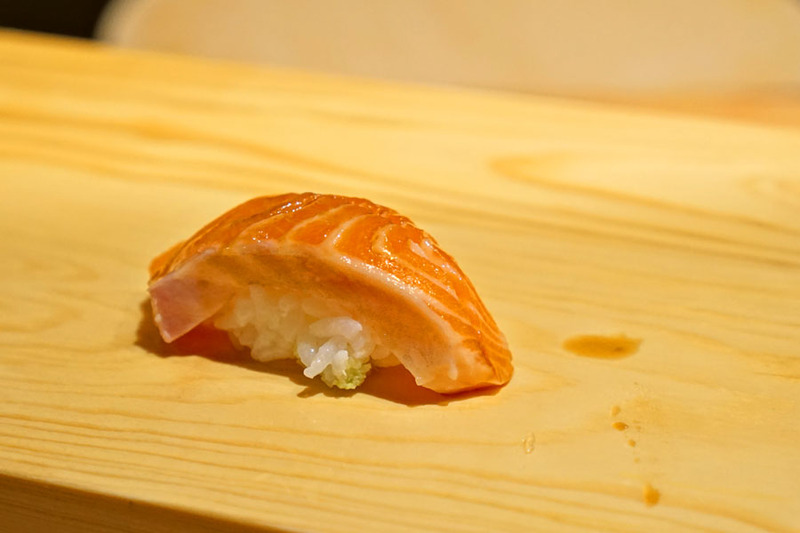 Niji Masu - Ocean trout from Scotland--I found this lean and wonderfully smoky. 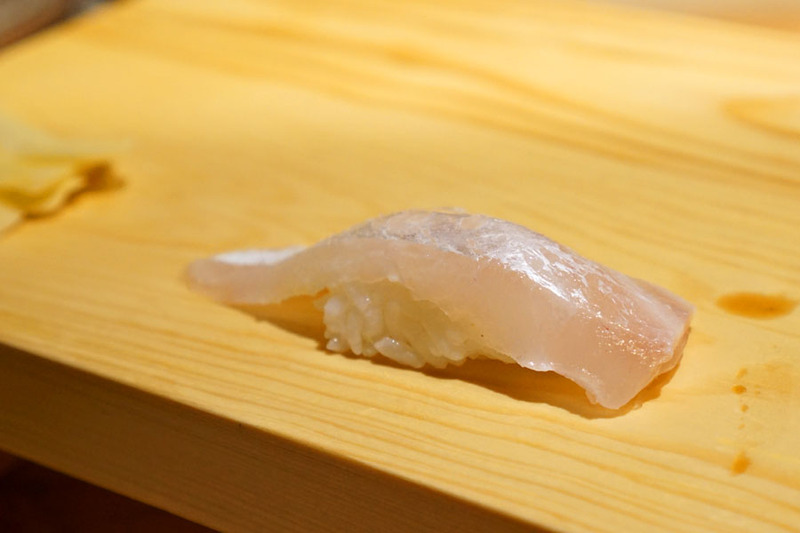 Hirame no Kobujime - Kombu-marinated halibut, heightened by the application of yuzukosho. Hon Hamachi - Last up was yellowtail, which was firm and crisp, with a persistent brine and somewhat less fat than usual. 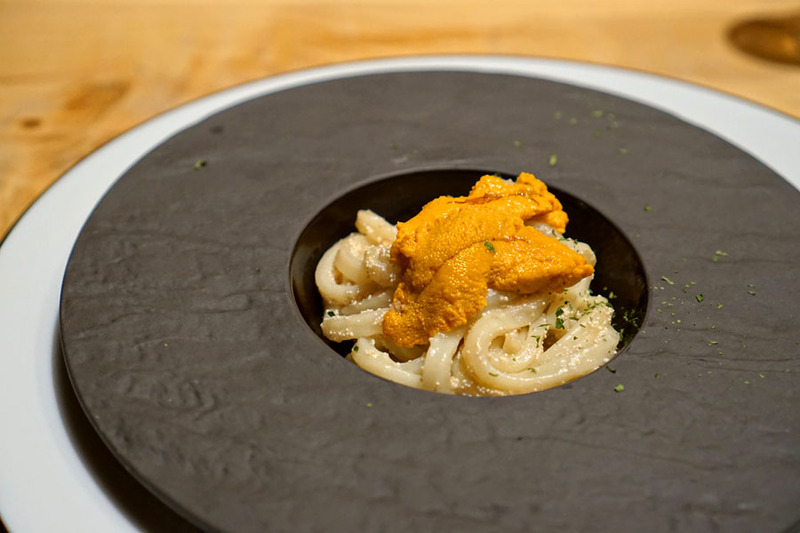 Here we had the Chef's signature uni pasta, one featuring udon, Santa Barbara sea urchin, white truffle, black truffle, and mentaiko. The noodles were thick and slick, but still picked up the essence of truffle, while the combination of urchin and pollock roe made for a sweet and spicy finish to the dish. Kicking things off nigiri-style was the bluefin tuna, a soft, sweet fish that actually could've melded a bit better with the shari, which seemed particularly cool here. 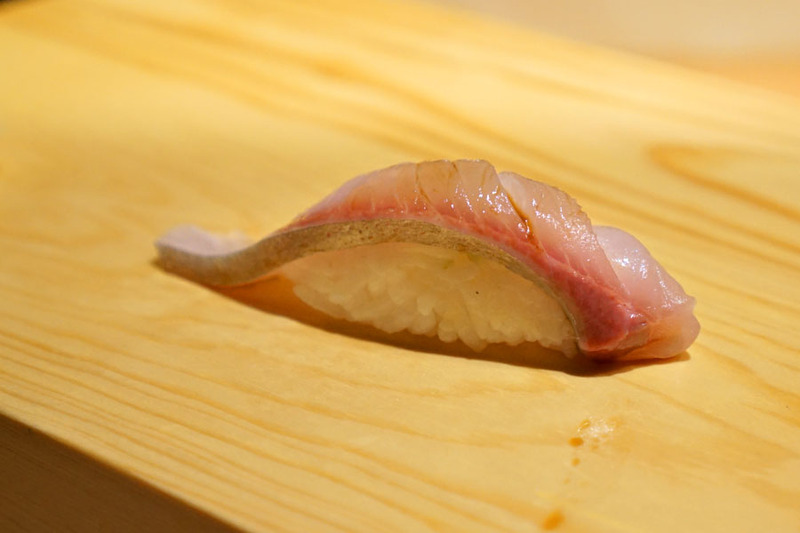 Amberjack was delightfully textured, conveying a very gratifying snap, while flavors were mild and delicate. 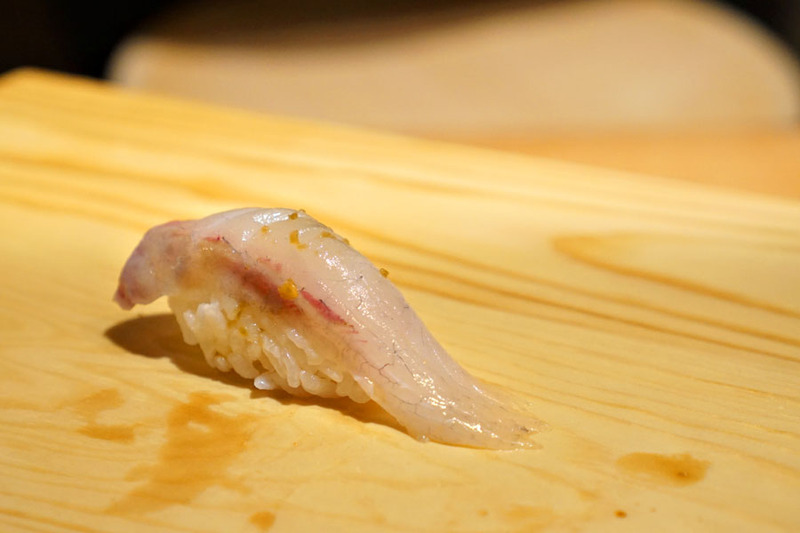 Japanese snapper was just right thanks to its squirt of citrus and pinch of salt. Ocean trout was a balance between lush and lean, and had a nice citrusy kick evened out by a persistent sweetness on the back end. Striped jack from Japan had a gorgeous consistency, while the punch of the yuzukosho on top worked as a great accent piece. 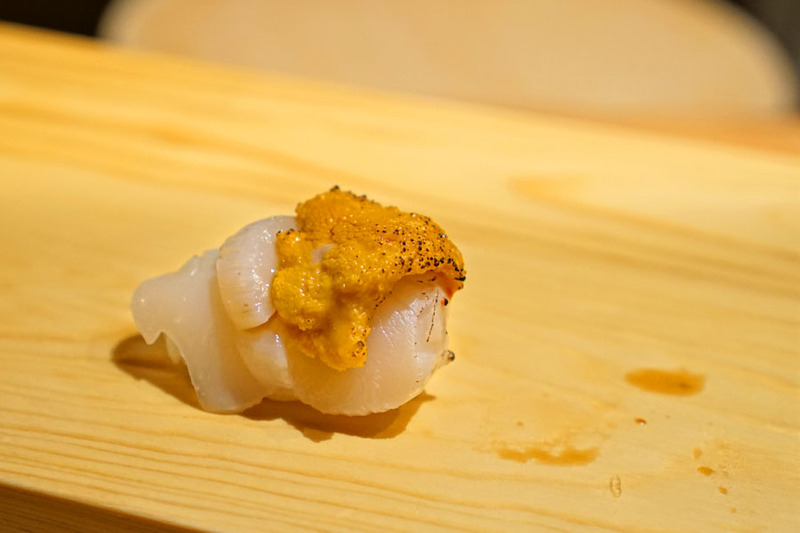 Japanese scallop and Santa Barbara urchin represented a marriage of sweetness and brine, further bonded together by a fruity sauce featuring what I believe was berry and garlic. 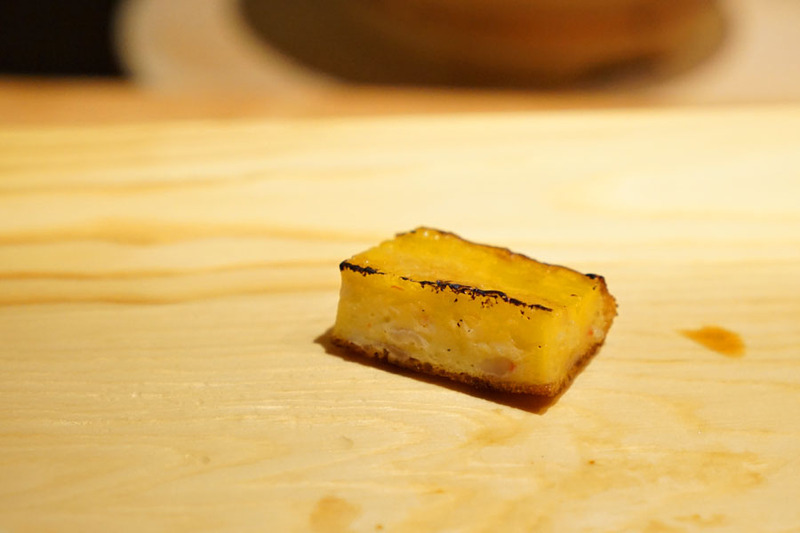 I was also a fan of the smoky sear present, as well as the burn of wasabi on the finish. 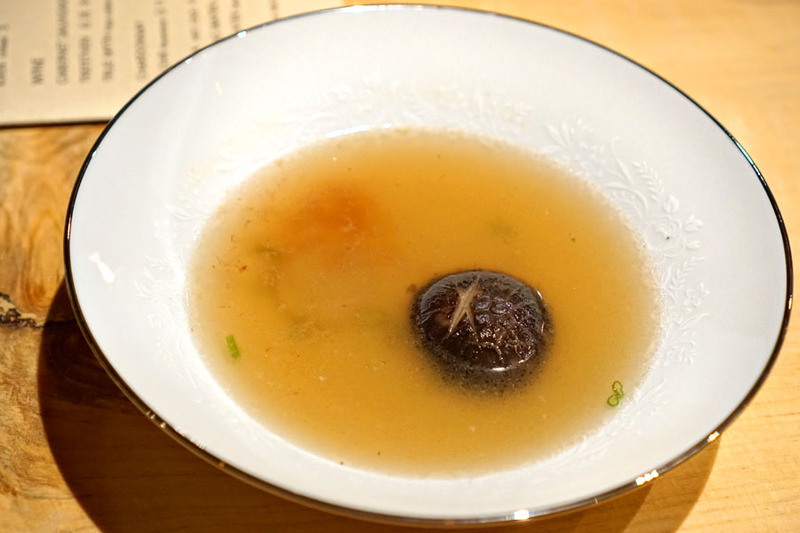 A break from the sushi came in the form of a fish broth, made from Japanese snapper, striped jack, and halibut (boiled for eight hours), along with shiitake and katsuobushi. The soup tasted strongly of the ocean, so the astringency of the green onion here was absolutely key. 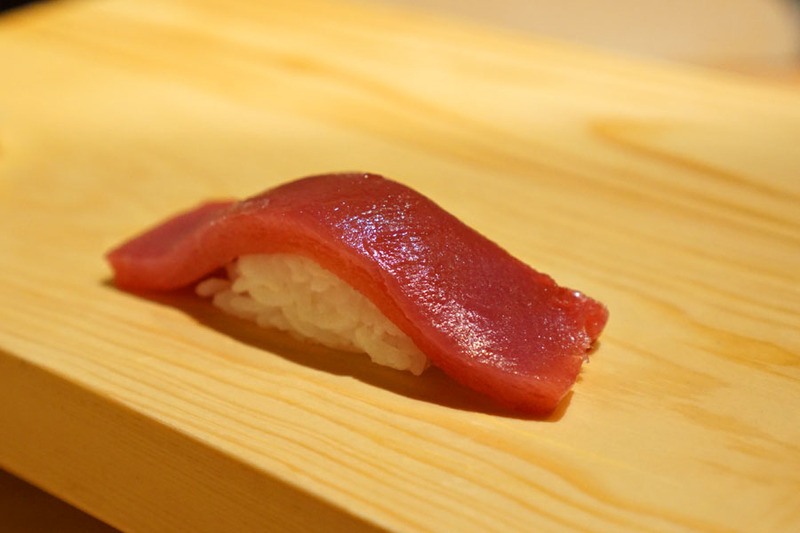 Bluefin toro was a treat, coming out almost unbelievably sweet, with plenty of fat and oil to boot. The rice was crucial here as a counterweight. With the wine gone, we enjoyed the Horin Junmai Daiginjo [$25] from producer Gekkeikan out of Fushimi, Kyoto. The sake had a delicate nose of sweet honeydew and light booze. I found the palate soft and sweet, bringing more vibrant fruit and a bit of creaminess, all finished by a touch of heat. Black sea bream was super balanced, and had a particularly savory quality to it evened out by the tartness of citrus zest. 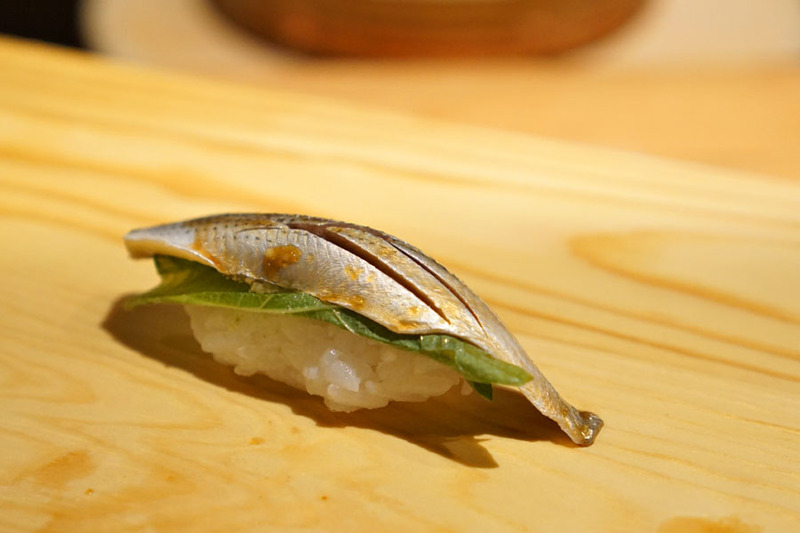 Lightly cured mackerel was slightly tangy, with a refined brine offset by notes of fresh shiso. 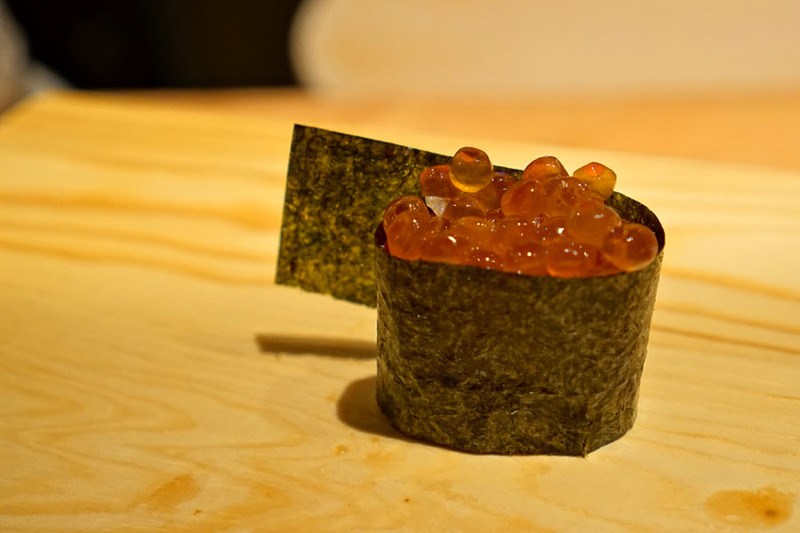 Salmon roe showed off the sweet-ish notes of its sake marinade, while the bite's nori wrapper worked beautifully for contrast. 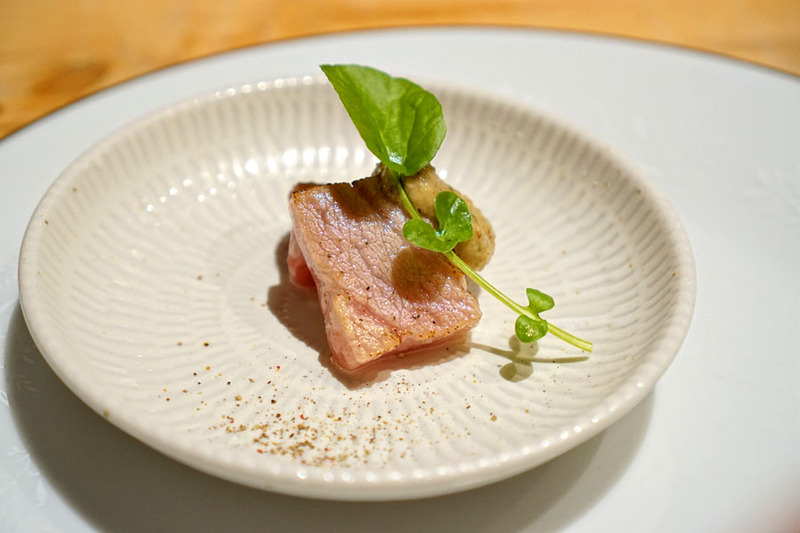 A supplemental piece, the gizzard shad had a marked salinity that was countered by a pickle-y tartness and minty notes of shiso. Incorporating Japanese sea bream and shrimp, Choi's traditional closer of egg was a pleasant surprise, and one of the tastier renditions of tamagoyaki I've had. What really worked for me was the sweet, caramelized crust of the egg, and how that played with the brine of the bream/shrimp combination. Dessert came in the form of a housemade panna cotta. 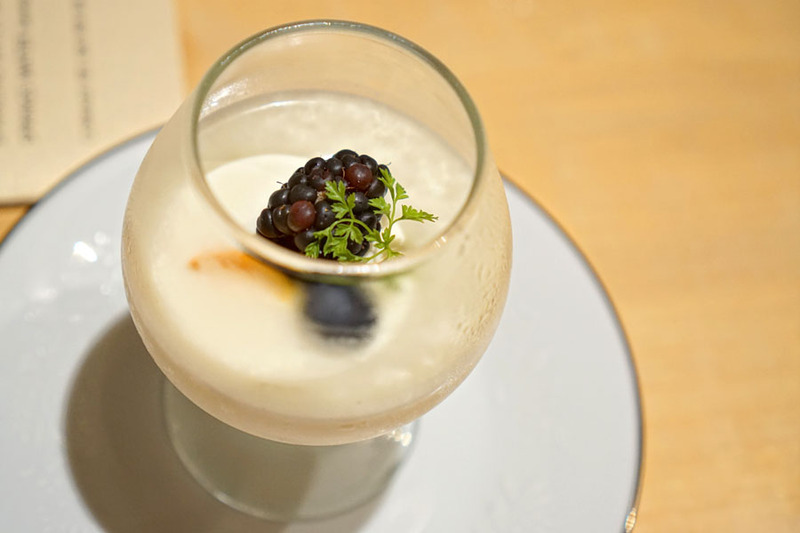 Think milky and sweet, with a touch of acidity from the berries. 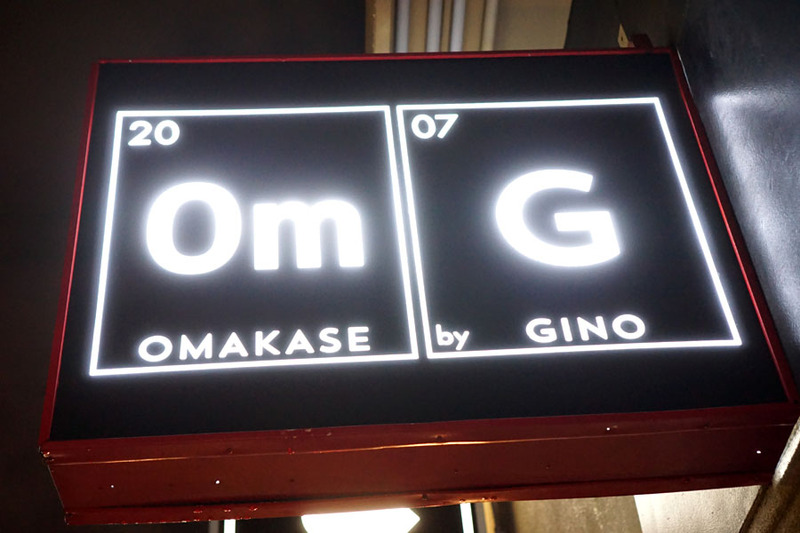 Despite the somewhat cringey name, OmG is indeed a welcomed addition to the Orange County sushi scene. Choi may take liberties with some of his food, though I think he stays true to the ethos of the cuisine, and I'm excited to taste more from him. Our dinner was a good value too, considering the length of the meal, its intimacy, and the ingredients utilized. Do note that the Chef's shari leans toward the sweet side, so keep that in mind if you're sensitive to it. I'm looking forward to seeing how this place evolves. Interesting to see you only bring one bottle of wine. Quite kind of you to show mercy towards the dining establishment. For the Price you get a great deal. 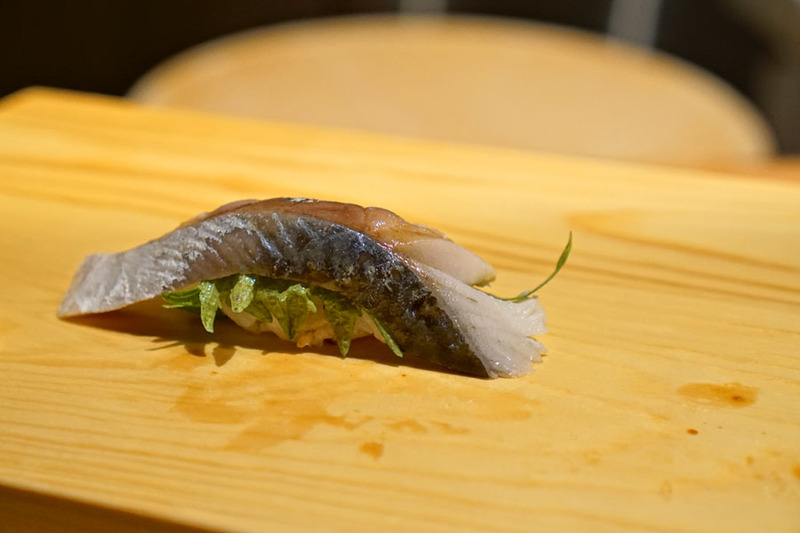 I think his style and location will help introduce many people to a good-enough Omakase experience; however, it is far off from a true Japanese Omakase.